Greetings. I am assuming that you want to apply for trademark registration with the name. Therefore i suggest the following names: COMMODAILY- the rationale is as follows: Rice,spices and salt are such commodities that most of the people eat them in some way or the other on a daily basis. The domain www.commodaily.com is available for purchase as well. 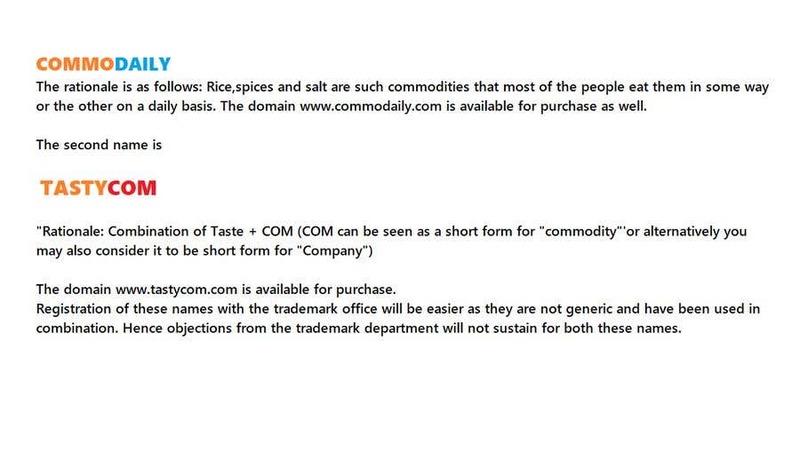 The second name is "TASTYCOM" "Rationale: Combination of Taste + COM (COM can be seen as a short form for "commodity"'or alternatively you may also consider it to be short form for "Company") the domain www.tastycom.com is available for purchase. Registration of these names with the trademark office will be easier as they are not generic and have been used in combination. Hence objections from the trademark department will not sustain for both these names. Regards, Jerson E. Bachelor of Laws, MBA Trademark|Patent|Branding Expert.